Does anything ever just make you mad? Like really, really mad? I'm there right now. I've actually had this post written for over four months, but I never published it. I've never published it because I'm afraid: afraid it will come across all wrong, afraid that people will misunderstand my heart, afraid that it's just too harsh. I see the exceptions to my words and the people who are the real deal, and I don't want them to feel like their lives are unseen or their witness is wasted because they're definitely not. In fact, they are the very people for whose sake I decided to publish this post, after all. Cultural Christianity is just so repelling and yet so alluring all at the same time. I felt like, for the sake of those on their face seeking Him, something had to be said, and I am tired of not being bold enough and just putting it out there. Without further ado, then, here are some thoughts I'd like to share despite the fear I still feel. Would you please read with grace and understanding? I would love to hear your thoughts on this endemic, too. Please comment, and we can talk over this some more. I'm so stinking sick of my generation saying they love God but never mentioning His name outside of Bible class or chapel (unless, of course, they need a convenient cuss word). I'm sick of people who believe we are supposed to be strangers and aliens in a world that's not our home but who I can't even pick out in a room of the secularized West. with people just believing what they hear and not searching for truth themselves. I'm so exasperated with people telling me to have a relationship with God while their prayers sound like they are talking to somebody they don't even know. Of these people claiming to know my God while living like He means nothing. I know I am in no place to judge. That's just not my role. I can't help noticing these things, though, and these thoughts keep surfacing. Where is the place where I walk into a room of my peers who call themselves "Christians" and feel the peace of Christ? Where is the place that Jesus is real to people? Where is it that prayer is powerful and people live dead to themselves, by grace, and through faith? Where is it that people are open to the Spirit and following His leading? 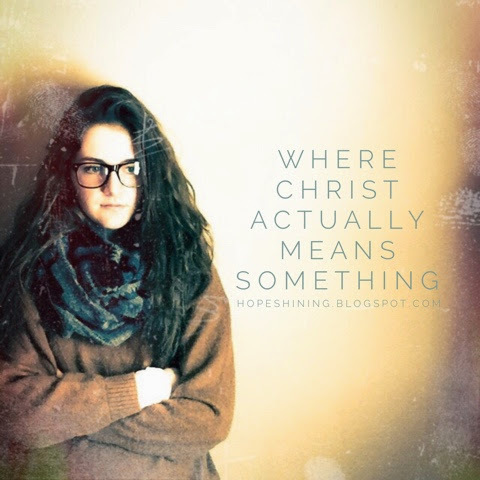 Where is it where Christ actually means something? Where his name has power and is seen at work in powerful ways? Where is it that He is more than a word in a song, a picture on the wall, a "good-doer" that your supposed to remember when asking "what would Jesus do?" When does it become less of "Yeah. I know about Jesus" to "No. I know Jesus!" Is He not more than another piece of doctrine we need to fit into our do-good lives? Is He not alive, the God-man? Doesn't a relationship with someone actually look like something in people's lives? Shouldn't we be spending time with Him and listening? He tells us of sacrifice. He tells us of being devoted. My soul aches to be part or a generation where Christ is more than a name, more than a name to sometimes include in our us-orchestrated lives. My soul longs to be part of a generation where Christ means something, where our devotion to Him isn't taken lightly but is a way of life, and where He is real in a real relationship. For there is power in His name. There's power in the name of Jesus, and I long to see it unleashed in our lives. Power to stand strong when everybody else is gone. Power to live even as we fail. Power to live bigger than ourselves. Power to give up and give to. To my generation - Jesus Christ is real. Please stop saying you are a Christian unless you are dead serious about it (ain't nobody got time for that). It's time to get real ... or get out. (And I truly hope that we choose to get real). This post was originally seen on The Rebelution.